we know travelers love to run away out of their abode but it is interesting to see their own rooms. featuring first three travel bloggers with their most loved spots of their room. more travel bloggers coming up on another regular eskapo series "travelers abode". So kikay Nina's room! And ugh, Marky fixed his room for the photo (LOL). I reckon, our room (whenever we'll have one) will be like Eileen's! a nice little peek at their most inner sanctum. They have very pretty rooms, i wonder when i can have a room as big as theirs, hehhee, I have a small house, nevertheless, it's still a house and a home for us. Sa ganda ng mga rooms nila feeling ko hindi room and room ko. wahahaha. 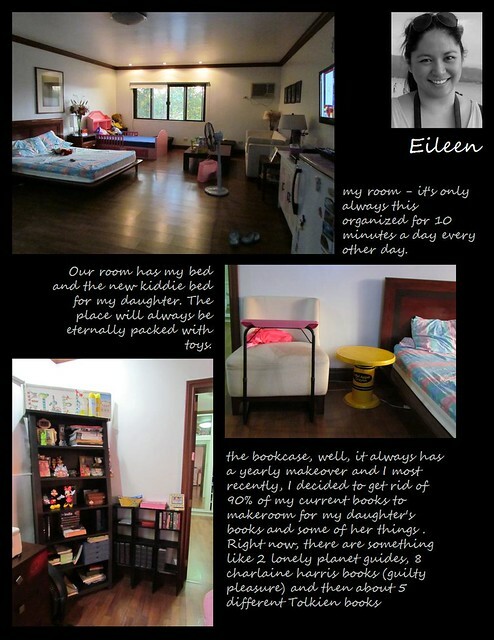 Maaliwalas yung room ni Eileen. P.S. Ano to Sir Dong, Kris-TV? bahay-salakay mala Kris Aquino? hehe. Pwede ring Dong-TV. LOL. 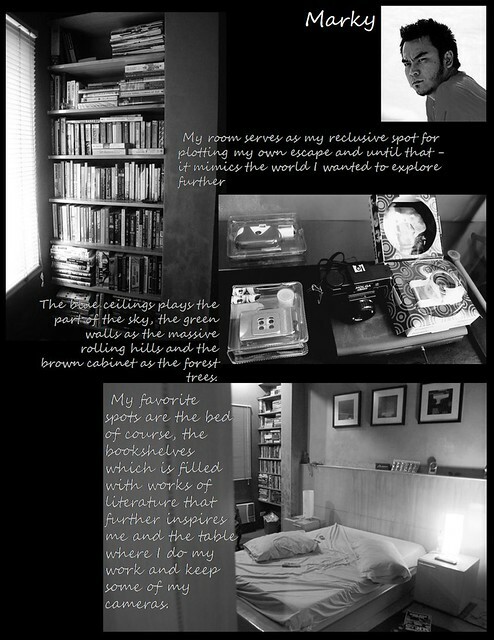 They have very nice rooms and very neat bookshelves. >gay, you made me laugh. seeing your temporary homestays will for sure be as interesting. >blissfulguro, thanks! i got this idea from reader's digest. in that section they featured rooms of kids from different countries. >gillboard, it's really nice to see people's room and their most loved spot. 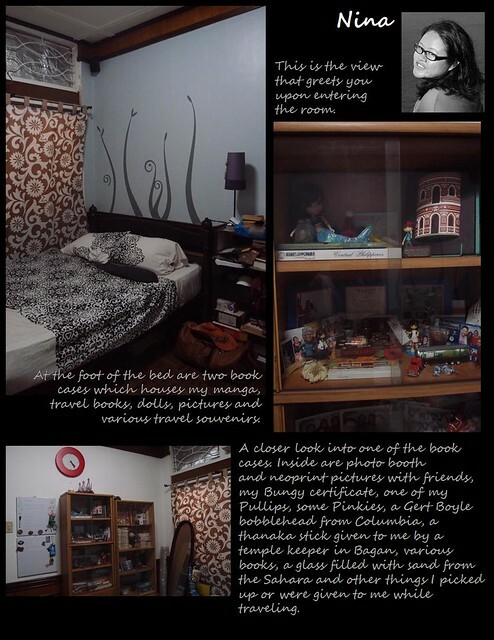 >chyng, hahaha... marky submitted two photos of his room in black and white kaya sinunod ko na rin yung isa. bagay nga yung wallpaper ni nina sa kwarto mo. >killerfillers, i imagine my mother saying that when we were kids. pero sipag niya maglinis ng bahay. >hi sheng, that i have yet to see. a happy family makes a real home. >rizalenio, true. more with travelers who we thought at first dont love their rooms as they want to travel more. >elal, ganda nga ng mga kwarto. dami pang coming na travel bloggers rooms. Very interesting blog! mala MTV cribs ang dating! bigla ako nahiya sa room ko haha. dong wag mo na i-post haha. Ang ganda ng room ni Marky! Great to see other blogger's inner sanctum. When do we get to see your bedroom? salivating over marky's lomo cameras. love this series, post more! ang ganda naman nung room sa dulo! char! i wish my room was always that organized!!! it's true na it's only like that for 10 minutes at a time, every other day-- if im lucky! it is kind of huge, i remember the first week we moved in - hindi ako makatulog kasi feeling ko nasa museum wing ako. ganda ng wall ni nina! LOL! Ang ganda ng rooms nila!!! Yung kay Eileen, wow ang laki!!! Very Nice photos and plae..Very relaxing..
i like this post. :) sayang, im not a traveller. my newly renovated bedroom will never be featured. (paawa effect) :P i like your guy friend's room. Interesting post, very nice people! Can i share my the photos of my crib? Hahahaha... Wherever go, we still long to be home! To be back to the comfort of our rooms!